Hi Diana--Thanks for the comment. I think it's a great book, and is in fact the one I have most frequently pulled from my shelf over the past year or so. 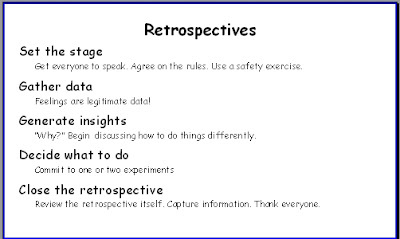 Is the retro to "post mortem" to be effective in reality? On paper it seems like a wonderful idea but we do the retro's, talk about all the things that went well, the things we need to change and try to keep them top of mind in the next iteration but once in the trenches its back to focusing on the 100 other things in a day that we need to do to get stories moving across the board. So retro's need to change to something interactive in the daily grind. Good point. It frequently happens that people agree on something vague and then don't do it ("pair more", "write better tests"). We've had to push for actual tasks, and get permission that one iteration can have so many days of time devoted to tasks identified in the retro. That has helped. We've actually done things that way. I think that most managers would be happy to sacrifice a few days of developer time per iteration to increase the effectiveness and/or productivity of the team.